Satanic Verses author Salman Rushdie won’t be attending a literary festival in India. It’s a depressing decision. Once again the baying of religious zealots has won the day in India. Salman Rushdie, who had been invited to India’s Jaipur Literary Festival, won’t be in attendance thanks to the intransigence of some Muslim clerics. The chief minister of Rajasthan, Ashok Gehlot, went to Home Minister P. Chidambaram to express his apprehensions about maintaining law and order in his state if the writer was allowed to attend the festival. Sadly, this form of close-mindedness is hardly a new phenomenon in India, and nor is it the preserve of some obscurantist ulema. Some years ago, Hindu extremists hounded the noted Indian painter, Maqbool Fida Husain, from Mumbai because they deemed that some of his portraits of Hindu icons were offensive. It’s certainly ironic that Husain was granted citizenship in the emirate of Qatar, hardly a bastion of liberal democratic values. Even the ostensibly secular, communist government in West Bengal couldn’t provide indefinite refuge to the well-known Bangladeshi feminist writer Taslima Nasrin. Worse still, the central government in New Delhi has been frequently complicit in these decisions. 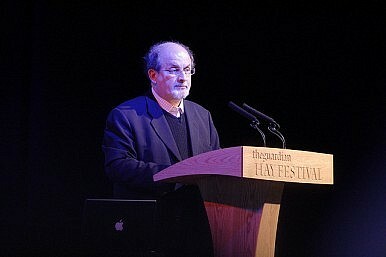 Among other matters, it promptly banned Rushdie’s novel, The Satanic Verses, putatively because it had insulted Islam. The real reason, of course, was that the Congress regime, which was in office, had one eye firmly locked on the votes of segments of India's Muslim community. For a state that has liberal and democratic values enshrined in its Constitution, it’s downright tragic that India’s politicians all too easily cave in to the outrageous demands of a small, parochial, illiberal but highly vocal segment of its citizenry. In the end, these compromises inevitably corrode the founding principles of the Indian state. No Quick Solutions for Kashmir India's Israeli-Palestinian Balancing ActIndia Feels Maldives TremorsIndia in the Hot SeatCoup in the Maldives?